This dip is effortless to make with two minutes of sauteing being the most time consuming part! Mild, creamy cheese studded with diced green chiles, jalapeno, red onion and garlic make a flavorful dip perfect for dipping almost anything. Keep it warm in the slow cooker to serve so the cheese does not solidify. Asadero Mexican cheese is an authentic variety used in making Queso Blanco. Should you not be able to find it, try substituting White Cheddar which though not authentic to the dish is more readily available. Spray the insert of a 4 quart (or higher) slow cooker with non-stick spray. In a mixing bowl toss the Asadero cheese cubes with the flour and add to the slow cooker. Also add the cream cheese or Neufchatel cheese, green chilies, and jalapeno. In a skillet melt the butter and sauté the onion and garlic only until they begin to soften (a few minutes). Add them to the slow cooker. Pour the milk over the mixture in the slow cooker. Cook on LOW temperature for 2 hours, stirring periodically to combine the ingredients as the cheese melts. 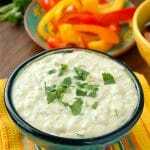 The dip is best served in a slow cooker to keep the cheese from solidifying.